When you were a kid, did you ever capture lightning bugs in a jar or wait patiently by the back-porch light for the magnificent luna moth to land nearby? I certainly did. I spent much of my childhood stalking through the neighborhood wild places fully equipped with the hunting tools of a ‘bug’ fancier. The world of insects fascinated me. As I grew older, other activities encroached on my ‘bug-time’ and my childhood interest went dormant …until one day of 2009 when I was introduced to Jerry Mixon. 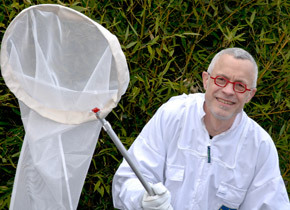 Jerry was a hobbyist beekeeper who had built up a business of poison-free capture and removal of stinging insects. I was amazed to discover someone else who knew the difference between a bee and a wasp and listened entranced as he told his story. When he got to the part about wanting to retire and sell his business, I’m sure my eyes lit up! When Jerry lamented that no one appeared to be interested in capturing insects, I immediately envisioned the old net in my hand once again. The chase was on once more! 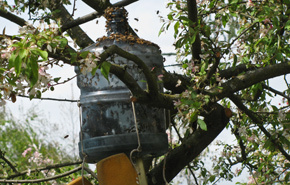 Top to Botton: Bee swarm in bottle. 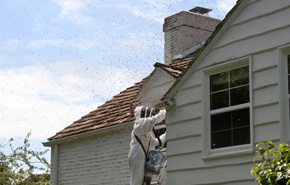 Catching a swarm as it is entering a house. German wasp nest. 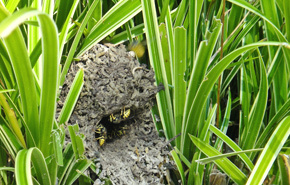 Western yellowjacket nest. 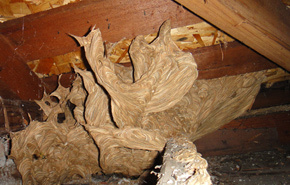 Bald-faced hornets nest (L). Bald-faced hornet (R). Today I am proud to carry on the tradition. I remove stinging insects in a poison-free manner, which lets you get back to your busy life. While some may turn to poisons or chemicals, I do the task without either. Don’t let hornets, bees or wasps interfere with your daily routines. I’ll quickly and safely remove these pests so your household projects such as painting or gardening can go forward. Your whole family can enjoy the yard once more. Let me “Take Away the Stingers”.